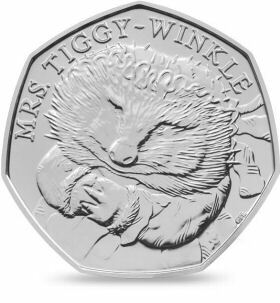 The Beatrix Potter Mrs Tiggy-Winkle design is the twentyfirst rarest Beatrix Potter 50 pence coin in circulation and has a value of 50 pence, but collectors of coins currently pay £1.40* to own this coin. Change Checking Chances: When receiving a 50 pence coin in your change you have about a 1 in 90 chance of finding this design. Do you have one to sell? : Recent sales of this coin on eBay achieved £1.27 to £1.56 based on a sample of 1200 sold items, taking the mid price* and a 10% range of ordered prices. Notes: Entered Circulation data from The Royal Mint website. *Active Circulation is an estimated figure based on an assumed year on year reduction in circulating coins.